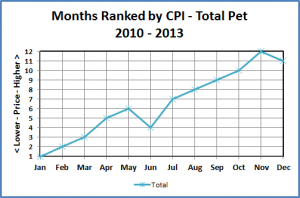 What’s the “best” month to buy Pet Products? 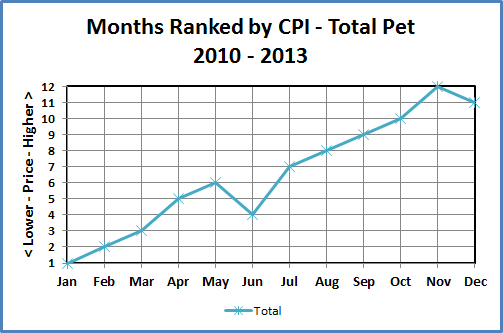 What’s the best month or worst month to buy Pet Products and Services…in terms of price? From 1998 to 2006 – This was a strong growth era of our industry and a gentle roller coaster of gradually rising prices. Prices went up a total of 29.5% in 9 years. An average year had 9 months with increases and 3 months with drops. From 2007 to 2009 – This was a time of steeply rising prices. There was an overall increase of 19.5 % in prices in just 35 months – without a single monthly drop. Coinciding with an economic recession, we saw the consumer impact of this. Our retail sales still went up – but consumers bought less and less in terms of the amount of goods and services. From 2010 to 2013 – In general, we have moved back to the gentle rollercoaster with overall prices moving up slowly again – 6.5% in 4 years – with an average year having 9 months with increases and 3 months with drops. However, there may be lingering effects in this recovery as supply prices continue to drop in a roller coaster ride which is generally headed downhill. Service Segments – The prices in both these segments have gone up unchecked at a high rate since they were first measured in 1997. 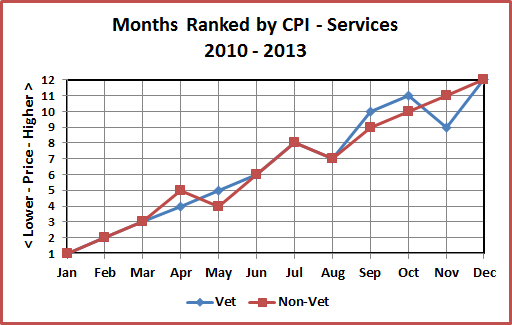 Veterinary Services have actually had only 13 monthly CPI decreases in 198 months of measurement. 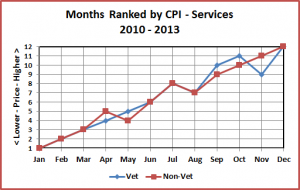 With only dips in 2 months during the year, the flippant answer to “When is the best month to buy any Pet Services?.. is…last month.” The actual answer is… January has the lowest prices and December has the highest in an average calendar year. Pet Food and Pets & Supplies – This is a bit more interesting. Pet Food prices generally rise through the first half of the year, drop in July, start to rise again, peaking in November…then fall radically in December. Of course, Food is an absolute necessity so the consumer must buy according to need. However, prices are lowest in the winter months – December through February. Officially, the cheapest month in the calendar year is January and the priciest is November. Pets and Supplies – Now you can see a “roller coaster. In general, prices are higher from February through May. They generally are lowest in the late Spring through the Summer months, hitting bottom in September. They start to build again as the Holiday season approaches, peaking in November. Then like food prices, they drop like a rock in December. So much for “black Friday”. Consumers should hang on. The odds are that the prices will drop as Christmas nears. The most expensive month is February and the cheapest is September…followed closely by December. The Holiday lift is of paramount importance in this segment. From the consumer’s view, they should buy early or buy late. 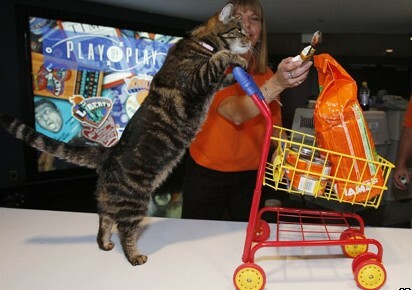 Total Pet Market – This looks pretty boring and there is no “roller coaster”! How come? The 4 year average gets flattened out by several factors. Three of the 4 segments, all but supplies, are generally moving upward in price as the calendar year progresses. While the years all have an average of 3 months with price dips they are almost always in different months. 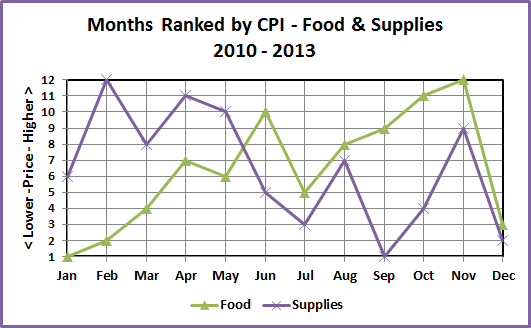 The Total CPI increase in 4 years was only 6.5% so the monthly changes are usually small. In general, the Total Pet market is similar in pattern to the largest segment – Pet Food. The overall best (cheapest) month to buy Pet Goods and Services in our analysis is the first month of the year – January. The worst is November – not December, thanks to annual price drops in both Food and Supplies. The Supply segment has the biggest monthly variation and the highest percentage of discretionary spending. It also traditionally has a large Fall/Holiday lift. The most important consumer “take away” from this analysis is probably – “Buy early (September) or buy late (December)”. Will prices peak again in November? 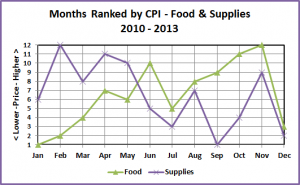 It seems likely as a December drop in Food & Supplies prices has occurred 5 years in a row. November has also been the priciest month 4 years in a row and finished no worse than second in this dubious contest for 14 out of 16 years. However, it is an unusual year as both Food and Supply Prices are down for the YTD for the first time since 2010 and…prices in the Total Pet Market actually dropped in January for the first time ever.